You know the 30 days of thankfulness that everyone does for the month of Thanksgiving? A couple of months ago, I decided to commit myself to not just a month of thanks, but a year of daily thanksgiving. Remember my post about social media and how I felt it was creating a spirit of discontentment? Every time I went on Facebook, Instagram, Pinterest etc...I was exposed to all of the things I didn't have (and didn't need either)! But as I looked at all of the beautiful houses, fashionable mamas, newer cars, and seemingly perfect lives of my friends and followers on social media, I started to feel discontent with my own life. Instead of allowing that attitude to destroy my life, I am taking action against it. I have learned that contentment isn't something that just comes naturally when your life is magically perfect. No one's life is perfect no matter how they portray it! Paul says in Philippians 4:11 "...for I have learned in whatever situation I am to be content." Contentment doesn't just happen. We can want it, wish for it, pretend we have it, and even ask for it, but from what Paul says, it seems to me that contentment is something that we learn, and that God gives to us as we seek it. 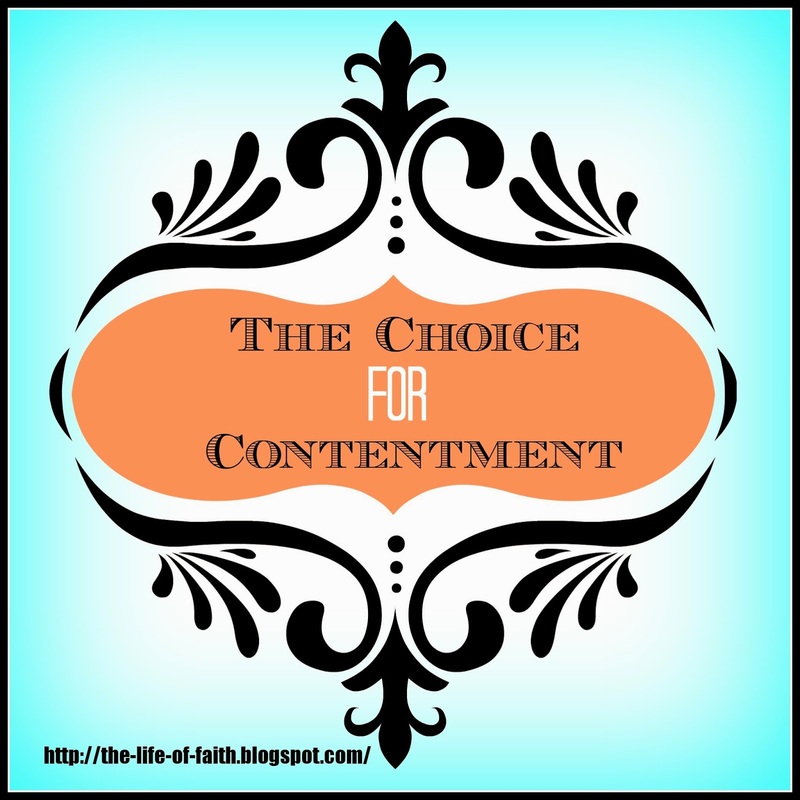 The Bible gives us some insight as to how contentment is learned. For example, Hebrews 13:5 says, "Keep your life free from love of money, and be content with what you have." I can personally testify that contentment is not dependent on money. A year ago, my husband and I were making a lot more money than we are now. With my husbands job transition, we also have had to make some financial adjustments. But I can honestly say that I am happier and more content today than I was a year ago. It's not about things, it's about perspective! 1 Timothy 6:6 "But godliness with contentment is great gain, for we brought nothing into the world, and we cannot take anything out of the world. But if we have food and clothing, with these we will be content." Our culture breeds discontentment with things. It's how companies market...if they make you believe that your life isn't complete without their product, you will buy it. I know I have fallen for marketing strategies several times! It's time to take a stand against consumerism and discontentment and fight for the right perspective! For two months now, I have faithfully journaled something I'm thankful for every single day. It has totally changed my perspective on life and I actually feel truly content, happy and grateful for the life God has blessed me with. In fact, with the right perspective, I actually feel very undeserving of all of the blessings in my life. Just to give you an idea, I've compiled a list of the top ten blessings in my life. Every time I look at this list, I'm overwhelmed with gratefulness to God for each of these things! 1. My relationship with the Lord and his faithfulness, grace and mercy toward me. I am so undeserving of his love for me, and it is only by his grace that I am who I am today. 2. My husband. There are no words to express how amazing my hubby is and how grateful I am for him. 3. My daughter. She has brought so much love and joy into our lives. She is an amazing gift and blessing from the Lord 4. Our families. I have the best siblings, and in-laws. They are some of my best friends and I'm so thankful for them! 5. Friends. I have been blessed with some awesome girlfriends, and a couple of amazing best friends who I know will always be there for me. 6. My husband's job. I am so thankful that God has blessed him with a good job in a great work environment! 7. My jobs. God has always provided work opportunities for me as we've had need. Right now I couldn't be happier working as a nanny, tutor and assistant for AllieRuth Design! 8. Our home. After a year of searching, I never thought we would find a home. Although it has been a big project (and that's an understatement), our house finally feels like a home and I love it! 9. Our vehicles. I know this may seem like a silly one, but having a vehicle makes life so much easier and it's not something I take for granted! 10. Our church. I am grateful for the Remedy and for the work God is doing there. I'm excited to be a part of it! I hope you are inspired to record things you are thankful for as well and join me in fighting for contentment! I think we should be thankful 365 days out of the year. Not just for a mth or on thanksgiving. Yes, absolutely! Thanks for your comment! This is so good and just what I needed. I was thinking about this today as I scrolled on Instagram and I started to feel discontent and envious of what others have and their lives. I had to pull back from social media for a while today. Writing a list of things that you;re thankful for is a great way to remain grateful for the things you have in life! Yes, Instagram is the worst lol! I constantly have to pull myself back to reality whenever I start to feel that discontentment creep in! Thanks for your encouragement Neisha! I love this! Something I know, I need to work on. This is actually my mother's life theme. Growing up she really instilled in us a need to revert to , and lean on these verses you actually posted. What a much needed and great post! I hope I can be a mother who instills this mindset into my children. How blessed you are to have her :) Thanks for your encouragement! Contentment is definitely all about perspective. What a great idea to journal about something to be thankful for every day. I try to do it mentally or in prayer. Great post. This is such an awesome reminder!! This is something I'm struggling with lately. Usually I'm pretty laid back, and it's important to hold on to that as things get stressful. Hello from Anything Goes Linky. I do think being content is a choice. I love my life and am so thankful for each and every little thing! Thanks for sharing this wise advice with SYC. Faith, what a beautiful and inspiring post! Thank you so much for sharing at Best of the Weekend. Hope you're having a lovely and happy week!